During CES most manufacturers dealing with consumer electronics showcase their latest and greatest offerings, and the US companies try to do their utmost best to display a boatload of things. They really need to make a statement on their home market, and along the way reap some good reviews from the press, which is on their side, especially when it comes to online media. However, no year goes by without public scandals and information leaks. 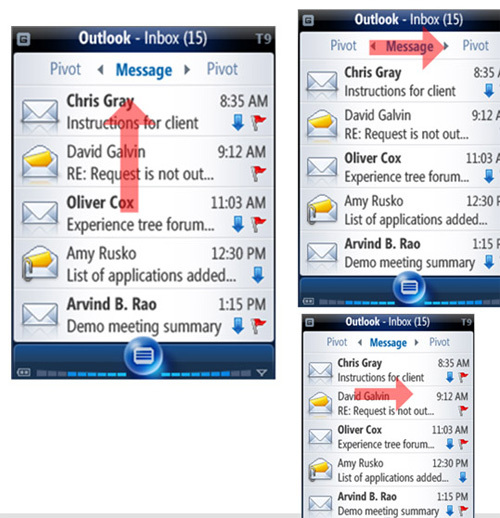 Probably the most buzzed event of this January will be the leak of Windows Mobile 7 screenshots, as well as the operating system’s functionality breakdown that popped up in the Inside Microsoft blog. Read the original document here. Before we get down to talking about what Windows Mobile 7, also known as NEXT inside the company (rather than 'Photon’ that got cancelled), will bring down the road, let’s try to find out who might get immediate benefits from this leak. As they said in Rome, "look for those who gain". Is Microsoft itself interested in all this fuss? Given the impending arrival of Windows Mobile 6.1 that they will have to sell at least during the entire 2008? Most probably not, as this leak gives a valuable edge to its competitors and thus allows them to come up with similar solutions. On top of that, some audiences, comprising consumers bent on all cutting-edge offerings, won’t be all that interested in the currently available devices running an already-dated OS in that the leak pretty much tarnishes them. And since techi make the biggest share of Windows Mobile consumers, it is quite safe to assume they have some idea of what's going on and what upcoming OS versions will look like, for not only do they track all official bits of information, they also have rumors in their scope. Effectively, the leak of WM7 info delivers a hard blow at the sales of Windows Mobile based devices in 2008. Obviously it is not the news any manufacturer wants to hear. Let’s look at it from the other end. What market is currently seeing strong Windows Mobile positions and decent sales of WM-powered solutions? Undoubtedly, it is the native market, where Microsoft is doing well, and the brand loyalty outweighs the letdowns of these devices. So which of the manufacturers would really like to have Microsoft alongside the makers of Windows Mobile solutions on the ropes? Clearly, not Nokia, which is trying to foray into the US market and settle down there with everything it has got, but it doesn't rival WM handsets in any way at that (again, in the US). And even if you imagine for a second that it is some cunning plan of Nokia’s, then it will be obvious that this vendor gains nothing with this. By sabotaging the sales of Windows Mobile, they won't be able to boost the sales of their own solutions, since they maintain such a miserable share in the total volume of offerings – that is, to get something form the NSeries range in New York you will need the store on the 5th Avenue or a ticket to Los Angeles, it is your call. And there is another option – online stores. All up, it would be very unwise of Nokia to do something like that, and one can accuse Nokia of anything except for being obtuse. Korean makers don't play these games since they have no skill in them, nor can see any gain in all this. What is more, if you take Samsung and LG into account, they are also hammered by the leak, as they produce a lot of WM-powered solutions. The very same reason rules out Motorola from the short-list – the company manufactures Windows Mobile phones for the US market and has a sales plan to meet in 2008. Moreover, in Motorola’s current condition, it couldn’t care less about these games. So, speaking of the major vendors, the only one left is Sony Ericsson. 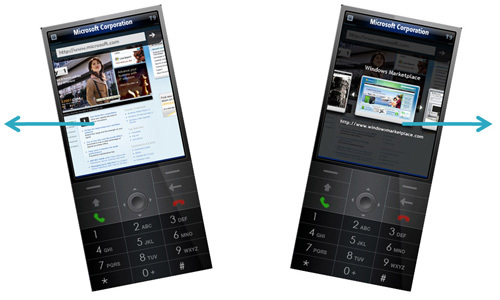 But unfortunately, the company offers no solutions that rival Windows Mobile in Europe of the US. To be more specific, there is some indirect competition between them, but nothing too serious. Now let’s remember that CES is an exhibition aimed at the US market in the first place, therefore the leak isn't meant to hurt Microsoft globally, but poke it on the native market. So the first thing occurring to our minds is RIM with its Blackberry, as Microsoft’s and RIM’s interests in the enterprise sector overlap in a big way. But what you can learn from the blog has very little to do with enterprise users, and gives RIM no significant advantage. In other words, RIM can't be looking to gain something from this leak. So who can actually feel good about the leak? There is only company that offers today the features that will be served by Microsoft, though with some tweaks and enhancements, with WM7. As you might have already guessed it is Apple and its infamous iPhone. I do realize that by saying this I’m kicking up a very big fuss once again, all is ask is this: if you have something to say about the matter at hand - please do. With analysis, facts and thoughts why someone other than Apple can benefit from revealing crucial information about Windows Mobile 7. But for the time being, not only does the leak affect the sales of WM-devices (don’t exaggerate the size of this effect, though, it is not that tremendous), it also promotes the Apple iPhone, and does a great job in this capacity. All in all, if you have some other explanations, we will be more than happy to hear them, and now onto our breakdown on Windows Mobile 7. Without going deep down the ladder of Windows Mobile versions, we should say that the OS philosophy has always been the chink in the armor for the company. They haven’t been good at picking the right opponents on the market – when Palm was at its zenith, Microsoft take the cues from it, then they set their eyeball on the phone market, and today the Apple iPhone is what they are focusing on. The world's leading desktop software giant has no sound philosophy as far as its mobile devices are concerned and always acts as a trend-chaser rather than a trend-setter. And that’s a time-time, which was first put into this OS when they thought of Windows Mobile as a branch of the desktop edition and gave it the same interface that the users had grown “accustomed” to. These devices were even positioned in this vein for a long while - the company was tireless, emphasizing their resemblance to desktop operating systems and hence their ease-of-use. But the feedback for the users turned out to be completely opposite, as they didn't think that getting a hang of mobile Windows OS was particularly easy. Over the entire history of WM-devices, only one vendor has made a go of it, and that is HTC. The reason for that is that design is not the only field they are investing in – extra applications that redeem Windows Mobile’s foibles and improve overall usability and ergonomics, are also a major focus. We could spend a lot of time investigating ever factor and reason that have led up to the situation the operating system is in, but in the end it all comes down to its awkward philosophy that urges the company to roll out multiple OS versions, that frequently differ only in very subtle ways and confusing consumers. The release of the seventh OS version, above all other things, is an attempt to create a solid and consistent OS from scratch. They keep the best ideas from the past editions and beef up it all up with fundamental improvements to the core functionality of the system. Given that the release date of WM7 will come no earlier than the first six months of 2009, they have a ton of time to work it all out. Although, the question still remains, whether this OS will be a breakthrough or just take the company to the level of other solutions out there? The OS is designed in a way to allow for devices with/without a keypad and a touchscreen. It doesn’t restrict such parameters as display size or diagonal, while the standard resolutions for the seventh version of the system are QVGA and VGA. In a word, that’s what we currently have with WM6 today, when the basic OS edition can be used for a wide range of devices with different technical specifications. And this is the right thing that they have to keep. 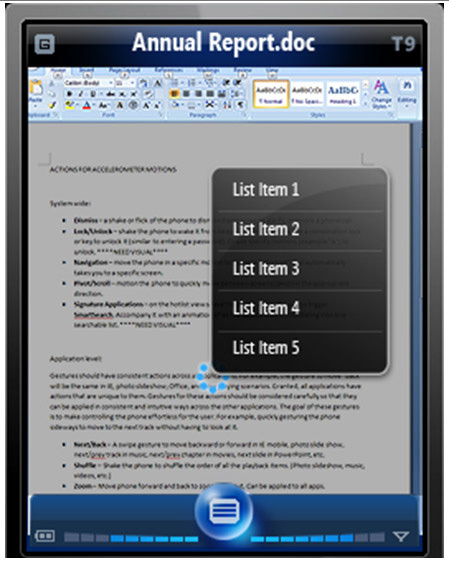 The user interface is tweaked for finger-based navigation, as well as stylus, allowing the user to take his/her pick or combine them. But the real highlight here is the system's rich set of options for touch-based device management, including the ability to scroll through lists at various speeds, scrolling in different directions, etc. The inclusion of an iPhone-esque on-screen QWERTY-keypad is still in question, but it is more likely to make it to the final release. 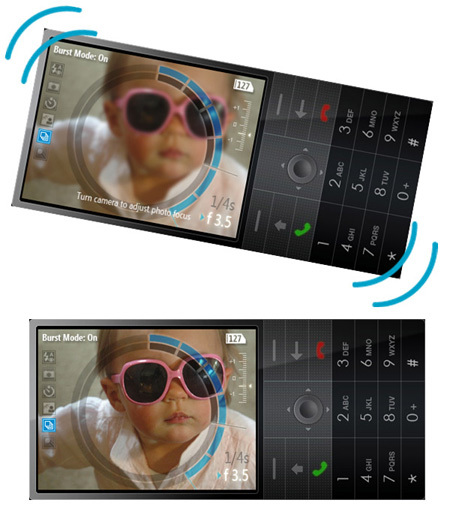 As regards the WM7’s touch-optimized interface, the UIQ editions found in Motorola’s and Sony Ericsson’s handsets are going in pretty much the same direction, S60 Touch offers this functionality as well, and of course the Apple iPhone, where it is the only way to move around the phone. By the time of its debut, the users will already have a rich experience of touch-centric navigation from a multitude of HTC's communicators running previous versions of Windows Mobile (all thanks to the TouchFlo UI). Bundled camera employed as a motion sensor - this is a pretty unsophisticated, yet an effective technology. This way, you can shake your phone to lock the keypad, answer a call or do just about any other thing. On top of the fact that it looks cool, the users will spend mere minutes mastering this interface. However, apart from some routine commands, like keypad lock, other applications of this technology seem to be more of a gimmick. For example, zooming in/out on a image by moving the handset forwards or backwards isn’t particularly convenient, since the distance between you the phone's display will change as well. Switching between pages by shaking the phone isn’t really interesting either. Probably, some will actually opt for gestures while in the music player, but that's about it. At present, Sony Ericsson is into gesture-based navigation with its phones, like the Sony Ericsson W910i, and Nokia is also experimenting with these abilities of its phones. These two manufacturers will roll out a couple of solutions with this type of navigation onboard in 2008, whereas the WM platform will lack this feat until 2009. The bad thing about this technology is that it makes all devices it hops on extremely power-hungry - that's the place where WM-powered phones will lag behind the competition, as for the gesture-based navigation to work, they will need to have their cameras in always-in mode, while Nokia's, Sony Ericsson's and Samsung's handsets require the user to press a dedicated key to allow this navigation mode. Visual enhancement of the interface. For the most part, it will touch the way the system’s menus are designed, so they will look more like the Aero theme of Windows Vista. 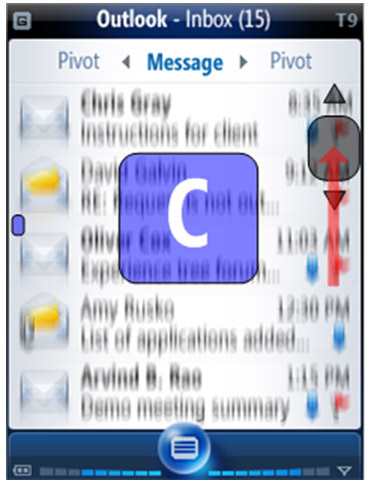 The seventh version also comes with animations for changing windows, and calling up the context menu can be done by holding your finger on the display. The standby screen will allow for various animations or clips. Rarely used interface elements pop up upon a tap or show up as semi-transparent icons. Drawing parallels with already existing solutions, it is obvious that Microsoft here was inspired by Apple’s experience. Music player, that improves upon the previous WM6.x versions of the OS and comes in with support for the next version of Windows Media. No detailed info on it as of today. Obviously, there is much room left for going into details about WM7, but what for? It will not change anything in a big way, specifically what the developers put into the system when they were only designing it. And if you take a good look at what is happening today, you will realize one thing. That is, once again, Microsoft picked the wrong opponent, and if you want to be really specific – the spectacular, yet still undeveloped Apple iPhone. Going through all features prescribed as the edges of WM7, it won’t be all that hard to notice that all of them will be implemented in the Apple iPhone 2G, 3G (second and third generations respectively). In fact, Microsoft has what is already available in prototypes and Apple’s development plans, only on paper or very early engineering samples. That’s where the long development time for WM7 stems from. By the time WM7 arrives, its capabilities will already look not so revolutionary, and at best will be on par with other solutions out there (if they will actually manage to do so, it will be Microsoft’s true victory, but the most probable scenario is that WM7 will be eye-candy, yet trumped by Symbian S60 and UIQ both in terms of the user interface and feature pack). The early leak of information on WM7 hasn’t sparked any craze – even today the new version of the OS isn’t hyped or discussed all that much. And what it is going to be in 1,5 years’ time? From my point of view, Microsoft suffers from one strategic misstep – the company picks wrong rivals. 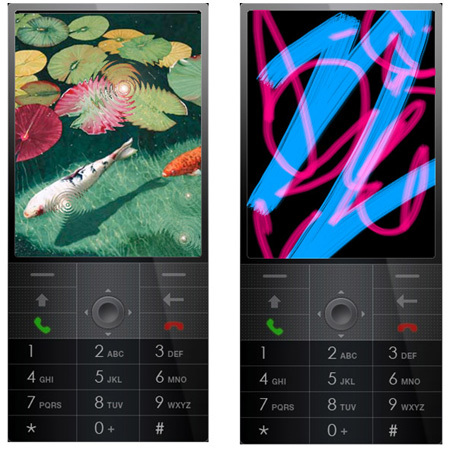 With the release of Nokia S60 5th edition it will become crystal clear, although, an updated edition of UIQ will well serve the same purpose. But then they will need to plan WM9 for 2011 and design it after already existing operating systems and user interfaces, which puts the company in the shoes of a chaser. Regrettably, already today WM7 brings nothing revolutionary, for it only aggregates the experiences of different manufacturers. There is nothing bad about this particular approach, but they will never roll out a solution that will take the competition down this way. 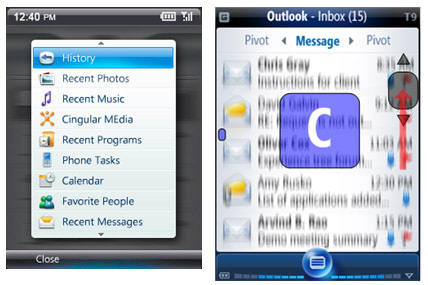 On the other hand, all changes brought about in the interface of Windows Mobile are very positive no matter how you look at them. The thing is, today this operating system stands out among all others for being somewhat archaic and not packing a lot of basic features that have been available in phones for ages. Wrapping it all up, I want to say that before the release of WM7 we have yet to see WM6.1 and a couple of intermediate versions. The OS keeps moving forward and that's a good thing. But it is more important for Microsoft to really start putting money into this field, rather than stick to some hazy funding principles, when the operating system seems to be the corporation’s own, yet unloved child, who gets only leftover funds. P.S. If, by any chance, you are offended by the thoughts expressed in this write-up, please discuss them in our forums in a civilized way, rather than reduce forum posts to angry exclamations, claiming that once again we have touched upon matters we would be better off staying away from. Just focus on facts and the OS abilities, and then we will have a good constructive dialogue.